Severe storms in north Georgia on Saturday expected to usher in a cold, wintry blast on Sunday to remind you that it is still wintertime. Despite the relatively mild, almost spring-like weather this week, it is still the deepest part of winter, and the weather is about to remind us of that. 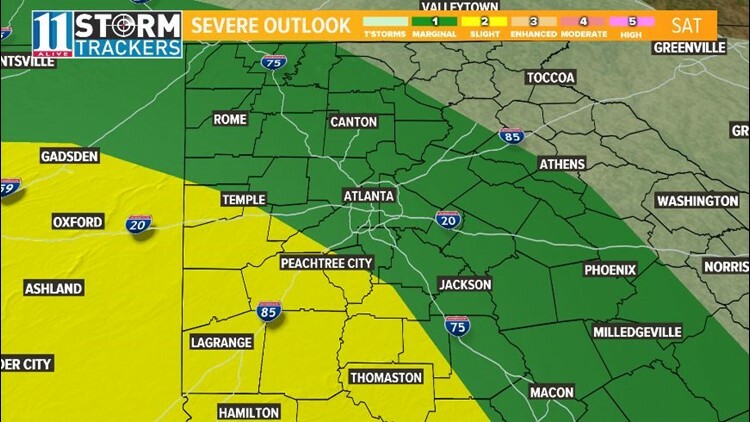 11Alive Meteorologist Wes Peery says the possibility of strong to severe thunderstorms exists across all of metro Atlanta for the late afternoon and evening hours on Saturday. 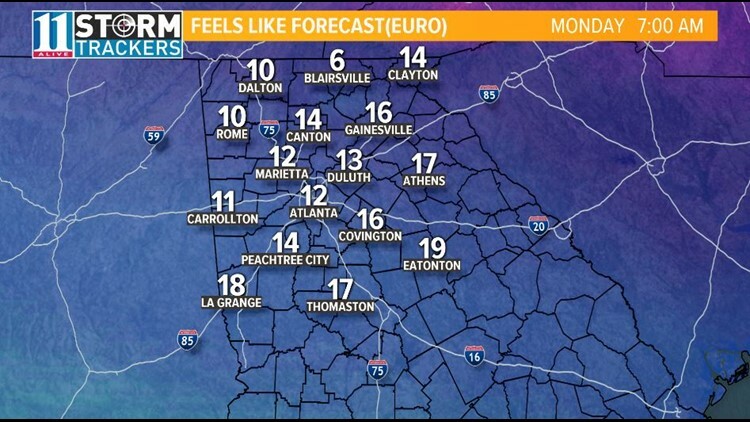 That will be followed by a cold blast that will chill Atlanta to the bone. The storms are coming ahead of a cold front that is tied to a strong winter storm moving across the upper midwest and into the mid-Atlantic states. Wes says the biggest storm threats for much of our area are torrential rains, damaging wind gusts and the possibility of brief spin-up tornadoes. As a result of the potential for severe weather, the National Weather Service Storm Prediction Center has placed much of north and central Georgia, including most of metro Atlanta, under a Marginal Risk area for severe weather for Saturday afternoon and evening. The south and western portions of the Metro Atlanta area -- primarily south of Interstate 20 and west of Interstate 75 -- have been placed in the higher Slight Risk area for severe weather. This location is also in a slightly more favorable area for tornadoes to be more long-lived. After the storms depart the metro area late Saturday night, Wes says to expect temperatures to expect cold air to rush in early Sunday morning. With some moisture hanging around behind the cold front, the possibility of snow flurries falling in some north Georgia counties early Sunday is not out of the question. But outside of a light dusting on elevated surfaces, especially in the higher elevations of far north Georgia, no accumulation is expected. Temperatures will plummet through the day on Sunday, dropping well into the 30s by afternoon. Wind gusts on Sunday afternoon will be out of the northwest, up to 30 mph, so wind chill values on Sunday afternoon will drop significantly, into the teens or single-digits. As a result, you will need to bundle up and cover any exposed skin when you venture outside. 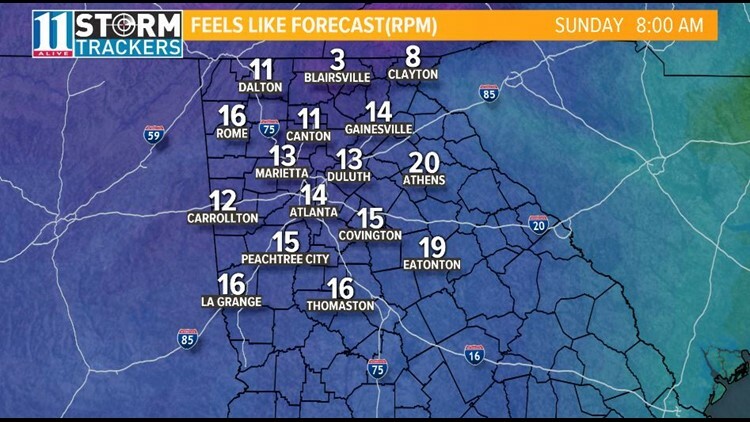 By Monday morning, Wes says the strong winds are expected to continue and wind chill forecasts may be as cold as the lower teens across much of north Georgia. Wes says this is only the beginning of a pattern the features several bitterly cold shots of air. 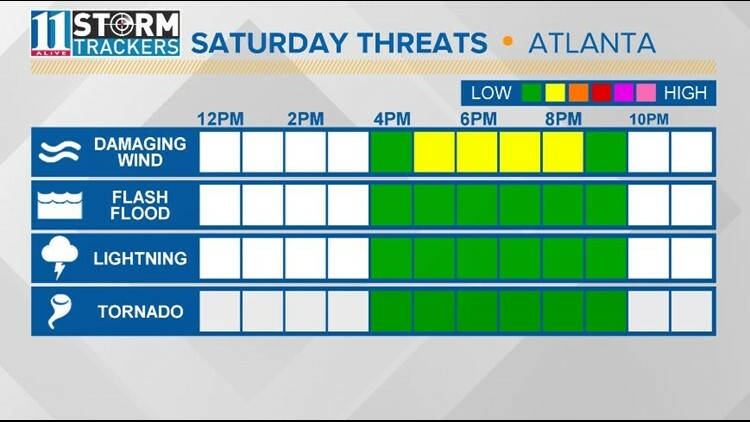 Stay with the 11Alive Storm Trackers throughout the day for complete updated forecasts and any weather advisories or warnings.